I just LOVE starting off the new year with a drawer full of fresh new dish towels!!! I buy new sets every two years and get so excited when it's time to purchase them! We don't have a lot of storage space in our small home, so after I wash and dry the dish towels, I fold them and roll them up so that they fit neatly into a kitchen drawer. Is there something that you do every year or every other year in your kitchen to make your house a home? Nope, not until now. What a great idea and I so need new dish towels. Thanks for the idea! Love the blue and white! Oh I never thought of doing that before. I just love new dish towels. I think you may have inspired me to purchase a few new ones myself. Mine are really getting rather ratty. At the beginning of every year I go through all of my kitchen cabinets. I take everything out one cabinet at a time. Wipe out the cabinet, sort, purge & sometimes re-arrange. It just feels so fresh once that task is done. I received some new dish towels for Christmas. They are the new Clorox approved towels so they can be bleached and any color won't fade. I thought that was a great idea! I like to change up the centerpiece on my island every so often to reflect the season and my mood. I also like putting candles there that remind me of kitchen scents. I LUV new dish towels also. I did a posting several months ago about my kitchen organization. I roll my towels too, i think they take up less room. The blue is a beautiful shade. Most of mine are red/white and I usually buy them as I run across a good deal on really nice ones. I remember seeing someone else post about doing this quite a while ago. I thought it looked like fun to do. But I got so many kitchen towels for my wedding that 9 1/2 years later I still have a drawer full of perfectly good towels. I have never bought towels for my kitchen! This is why I love blogging so much! I have been married for 27 years, and never, ever thought to "roll" my dish towels! Thank you, Mrs. U! BTW, I think we have the same ones, are they from Williams Sonoma? Yes, Susan, they are Williams Sonoma. LOVE all their products!!!! And I agree with you- you can find LOTS of great ideas on others' blogs, can't you? What a blessing to be able to learn from ladies all over the world!!! I love this color combo... my kitchen is blue, yellow, and white. Oh,I love those new dish towels! I think it is about time for me to renew my stock as well, and now I'm extra excited :-) I needed a good storage idea, and this seems like it will work perfectly. Thanks for posting! Your dish towels are so pretty, I *love* the blue and white! 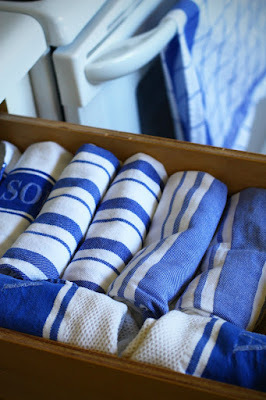 Love your new dish towels and love that you roll them up to fit them all in the drawer. I also love your idea of replenishing with new every two years. It's a good practice to get into. Thanks for sharing. I could use some new dish cloths. I used to buy new pillows every January.